It’s been one of the toughest rallies of the season so far but we’ve come away from Rally de Portugal with fourth place – our best ever finish in the Portuguese event. There were four stages left to contest on Sunday morning with Vieira do Minho and the legendary Fafe stages each run twice. The Fafe test includes one of the most thrilling jumps on the WRC calendar – and our drivers Dani and Thierry certainly put on a good show. Dani enjoyed a trouble-free final day to take the #4 New Generation i20 WRC to fourth place overall. It was his third fourth-place finish in a row, and scores valuable points for our team. Our Spanish crew had a strong run this weekend. Although the podium had looked likely after an encouraging Friday, the duo dropped down the order on Saturday. They sensibly focused on securing fourth place in today’s stages. The classic Fafe test was one of the highlights of the final day. A fantastic turnout of local Portuguese and travelling Spanish fans made an electric atmosphere with the numerous wind turbines providing a dramatic backdrop. 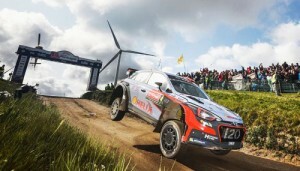 Thierry also enjoyed putting his New Generation i20 WRC through its paces on the famous Fafe jump! Thierry and Nicolas put Saturday’s disappointment behind them as they completed the event under Rally 2 today. The Belgian crew are already planning a comeback at the next event in Sardinia – with happy memories from last year. Michel gave a typically honest assessment of the weekend. Hayden and Kevin’s retirements on Friday were a prelude to more disappointment on Saturday. Kevin re-joined under Rally 2 but could go no further than the opening stage after hitting a rock. Then, problems with refuelling caused Thierry to stop midway through SS11.